Old Mother Goose materialised in Paris at the end of the seventeenth century telling folktales round the fireside. 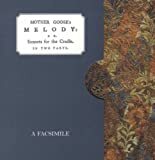 How natural then that when, in 1780, one of her English publishers put together some folk verses (probably assisted by Oliver Goldsmith) he should assign the authorship to her and call them her melodies. At the conclusion he also poked in some Shakespearian lyrics by way of giving the exercise some respectability. The project looks to have been wholly successful, judging first by the forty-odd years during which the work remained in print, and second by the almost complete disappearance of that forty-year production run - 'read to bits' as the saying goes. Nursery-rhyme enthusiasts however will have had some chance of access to the book through a facsimile published in 1904 of the earliest surviving copy of c.1791, but even this is now something of a rarity so there is every reason to welcome a fresh facsimile, albeit from a slightly later printing. 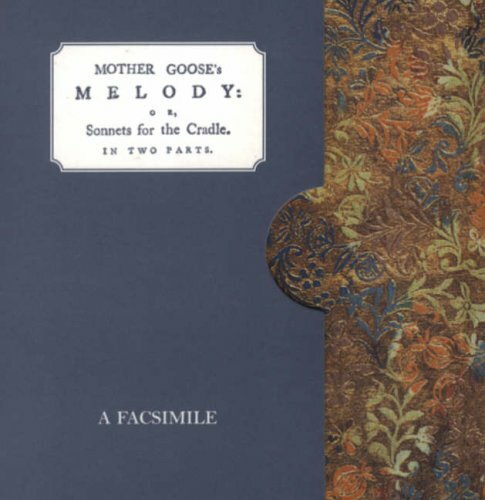 Many of these melodies suggest that Old Mother Goose was a sharpish character with a liking for mockery, farce and general obstreperousness on the lines of I won't be my father's Jack I won't be my father's Gill I will be the fiddler's wife, And have music when I will. But what, in historical terms, is most notable is that over thirty of the book's fifty-two rhymes (including one in the Preface) are here appearing in print for the first time while at least another five are from sources so remote that they may well have been unknown to the editor. And that makes for a slightly magical mystery which the Melody shares with its marvellous, but entirely unrelated predecessor Tommy Thumb's Pretty Song Book of 1744. For was it solely a commercial impulse that drove these eighteenth-century editors to assemble collections that have come to last in essence down to the present day, and how did they go about assembling them anyway? From the roughness of the contents here, and the sometimes hiccuppy rhythms, a direct transmission from 'the old British nurses' seems more than likely. There is certainly a designing hand behind the compliation with clear evidence of an attempt to give order to the disparate contents. And the editor, seeking perhaps to defend himself against accusations of dabbling in trivia, supplies ironical titles to some rhymes ('Ding dong bell' is 'Plato's Song') and moral maxims or pseudo-scholarly notes to most. Above all - and this is the foremost reason for the publishing of this new facisimile - it can now be shown that the wood engravings that accompany all the rhymes (here somewhat muddily printed on unhelpful paper) are among the early work of the great Thomas Bewick of Newcastle upon Tyne. Nigel Tattersfield, a leading authority on Bewick, sets out a conclusive case for the cuts being those ordered from the Newcastle workshop in 1780 as 'small Fable cuts', and he gives admirably full background details in his Introduction to the publishing history of this resonant little book.